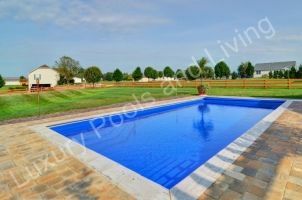 Pavers around a pool offer numerous benefits. Similar to decorative concrete the options are endless and are only limited by your imagination, creativity, and of course budget. The main benefit to pavers is aesthetics. To most people they look nicer and have a more elegant feel than decorative concrete. Even the best and most well installed concrete cantilever coping doesn’t look as clean as a coping stone or a paver at water line. This is due to the basic nature of pavers. Pavers can simply be more ‘perfect’ than concrete meaning that if you’re willing to spend the money on good coping stone, the time selecting individual pavers, and willing to keep up with some maintenance the overall final appearance is more ‘perfect’ over that of concrete. Another benefit of pavers is that they don’t crack like concrete. This means there is no need for tooled joints or saw cuts and should a paver(s) need ‘repaired’ you can simply remove and replace it. Perhaps not a deal maker or breaker but an often overlooked benefit to pavers is their slip resistance over decorative concrete. We add a slip resistant additive to our concrete sealer before we apply it but it is still much more slippery than pavers. Particularly when wet. As for cons the main deterrent for many pool owners is the overall cost of pavers over concrete. They simply cost more. Typically $2.00-$4.00 more per square foot minimum. The costs are also complicated to get to because the paver industry is complicated. Multiple pavers that appear to be the same or similar may have very large cost differences because of their material and/or manufacturer as well the pattern desired. 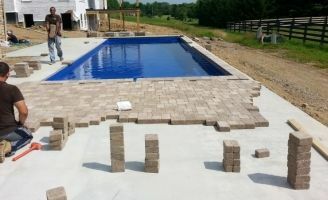 This usually means that exact paver materials and the pattern and layout HAVE to be figured out before any costs can be calculated and presented. Concrete on the other hand is significantly easier to price out and quote. Another con to pavers is the sand. Sand is used in most installations as the final bed material for minor elevation changes as well as for the ‘sanding process’ which is the installation of sand between all of the pavers to lock them into place. This process has been the standard for years but does make for a sandy mess around a pool as well as allows for some settling issues long term. The loose sand is also a place for the weeds to grow and ends up being an annual maintenance item. The good news is there are solutions. To avoid the sandy mess around the pool there is a product available called polymeric sand or polysand for short. This fine sand is stabilized with portland cement so that it hardens up and locks in the pavers. It can also be ordered in colors to compliment the paver. There are some tricks to installing it but overall this keeps the sandy mess at bay AND helps prevent growth of weeks and moss in the cracks. As for settling there are ways to get around that as well. Though a good base, if well installed, can be ‘good enough’ we highly recommend installing pavers over a concrete slab. 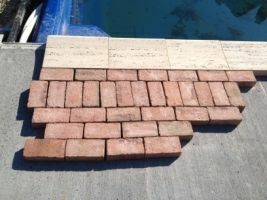 We have simply had better luck with this method and believe it is the most durable paver installation there is. There are obvious costs increases associated with pouring a slab rather than using a stone and sand base but we believe they are worth it in the long run. Minor cracks and settling may occur in the concrete slab base below the pavers but will almost never be detected in the pavers above.